Toledo Wedding Photographer - Kurt Nielsen - Page 54 of 54 - Wedding Ideas and Photos from Weddings in Toledo and the surrounding areas. Research is a very important part when it comes to making your final choice for your Wedding Photographer. Not only should you be able to see examples of their work and pricing information, there are several other things you should know about the person preserving your memories of one of the biggest days of your life. Q: How soon should I book my photographer? A: I’ve noticed the popular answer in most of the wedding guides tell you to book 9 months before the wedding. What you have to remember is that good photographers will sometimes book over a year or more in advance, especially during popular wedding months. Therefore, the sooner you can book, the better. Q: What is your photographic style? A: My wedding style is a combination of Traditional, Portraiture, Contemporay and Photojournalism. And, of course, there are fun shots thrown in for good measure! Q: How much experience do you have photographing weddings and is this the only thing you photograph? A: I have been a professional photographer for over 20 years and photograph just about everything from babies, children and families to businesses, schools, bands and sporting events to even domesticated animals such as horses or pets. I have even photographed some famous celebrities! In that 20+ years, I have photographed over 700 weddings. Q: Are you available to shoot extra hours and how much do you charge for this? A: Yes, my usual rate is $125 per hour over the package price for extra coverage. A: Absolutely! You can never be too careful! Q: How many photographers will photograph my wedding? A: I will be the only photographer that will actually be shooting. I know the popular trend now is for two photographers. Generally, when there are two photographers, one is the main “shooter” for the event and the other captures the audience reactions or shoots the same thing at a different angle. Also, many times the second photographer may be a student or someone trying to get into the photography business. If you also include Kurt’s Kustom Keepsakes in your package, my assistants will be running that and at least one will have had professional photography experience. Q: What equipment do you bring with you on the day of the wedding? A: Obviously I will have a camera and lighting with back-up equipment, plus anything else that would be needed based on what you want me to photograph. A: I have been shooting digital for many years now. Q: Do you shoot in color or black and white? A: I always shoot in full resolution and in color. Any pictures that you want to have special effects can be edited later. I have extensive knowledge in PhotoShop, LucisArt and Painter, so I can create whatever type of images that you would want. A: I have lots of experience shooting in all lighting situations. Q: Will you be the one photographing my wedding? A: Yes, I am the only one from Kurt Nielsen Photography that photographs the event, but if you just have Kurt’s Kustom Keepsakes, and not my Wedding Photography services, I may have other people photographing the green screen shots. Q: Do you schedule yourself for more than one event in a day or weekend? A: I only book myself for one event per day. As I stated above, if my wedding photography services are not required, someone else may be the photographer for Kurt’s Kustom Keepsakes. Therefore, I could have two different events in the same day, but I would be the one that would photograph the wedding. Q: Do you have a replacement photographer in the event you become unavailable on the day of the wedding? A: I have never missed an event (knock on wood), but if there is some dyer emergency, yes, I could provide a back-up photographer. Q: How soon after the event are the proofs ready for viewing? A: Usually within two to three weeks after your wedding, I will have your photographs posted on line and have your lifelong DVD (which is yours to keep) ready for pick-up. This, of course, depends on how busy my studio is at the time because I do all of the photography and editing. Q: Do you retain the copyright for the photos and the right to publish the photos? A: I retain the rights to use all images for advertising, samples or other purposes, and this is in the written contract that the Bride and Groom sign when they book my services. My Elite Wedding package includes a disc of all of the original images. For any other package, a disc of the original images may also be purchased for an additional fee. Any images that have been created from the original images (Art Images) will not be included in the disc. Q: How many photographs will you take? A: I never limit the number to a minimum or maximum amount. The number depends on what you want me to photograph and what is going on during the day. It is nothing for me to have taken over 300 photographs before I have left the wedding site (church) and over a thousand before the night is over. Q: What kind of albums do you offer? A: This depends on the wedding package that is purchased and the customer’s needs and wants. I have several style samples in my studio for viewing. Upgrades and extra albums are also available. Q: When will we receive our wedding album? A: Once the bride and groom receive their proofs from the wedding, they should begin to decide on which images they want for their wedding album. I will then create their wedding album pages and have the bride and groom approve the pages or make any changes. As soon as I receive the final approval from the bride and groom, I will submit the album pages for the album to be created. Once the album artwork is submitted to the printer, it usually takes two to three weeks for the album to arrive at my studio. Basically, the process depends on how many changes are made and how soon the bride and groom give me the final approval for the artwork for their album. Q: How will you dress for my wedding? A: I will be appropriately dressed for the occasion, depending on your dress code. Obviously if it is a formal wedding, I will not show up in Bermuda shorts and flip flops and if it is a BBQ reception, I am not going to show up in my tux. A: If you are just postponing your wedding to a later date, I will transfer the deposit as long as I am still available for the new date. However, if I am not available or you cancel the wedding completely, the deposit is non-refundable unless (and until) the date can be re-booked. A $400 deposit is required to hold the date for you. The rest of the amount of your package price is then due no later than two weeks before the wedding. Of course, the $400 will be applied to your package purchase price. I hope this helps you in your research for your wedding photographer. Of course all consultations are always free so if there are more questions, which I am sure you will have, I am always available to answer them. Just call my studio at (419) 885-7153 to schedule your free wedding consultation. Your Wedding Day is all about you! My job is to tell the story of your Perfect Day from Beginning to End. And don’t forget the dress, shoes, bouquet and accessories! And all of the intimate moments in between! Only an experienced wedding photographer can tell your story, your way! Call Kurt Nielsen Photography at (419) 885-7153 and let Kurt tell your story! Your special day is filled with passion and excitement, laughter and tears, family and friends. Choosing a photographer with over 20 years of professional photography experience and having photographed over 700 weddings means that you know all of those precious moments will be captured. Having a photographer that has extensive knowledge of today’s digital photographic technology means you will receive images that are as unique as you. My time as your wedding photographer starts with your initial consultation. At our first meeting, we will discuss what options are available with photographing your wedding day, and your expectations of your wedding pictures. 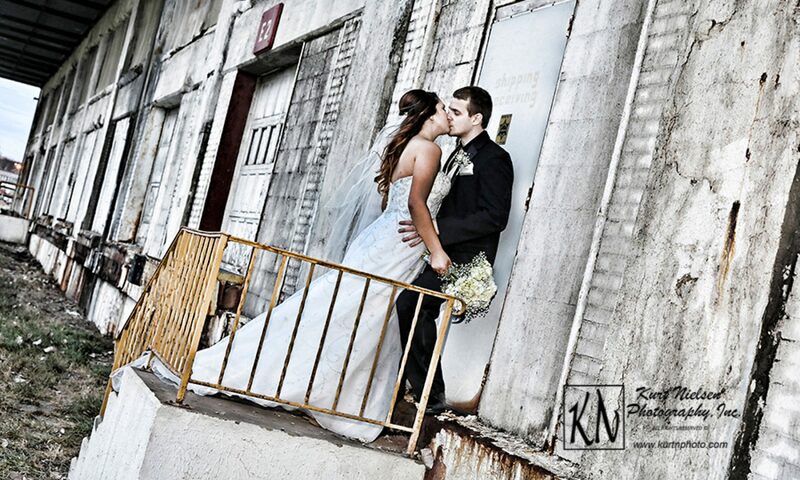 We will also customize your wedding package in order to fulfill all of your photographic needs. Of course, this will not be our only contact before the big day. From previous experience, I know things will change. You may realize that things will not work out as you have previously planned and need to make changes. I am more than willing and able to give you my perspective of how to make things work better when location and timing are at issue; so don’t hesitate to call me with your questions and concerns. I also have no problem working with a wedding planner, if you have one. I will then meet with you again a couple of weeks prior to your wedding day to finalize your photographic plans. When the big day finally arrives, I will be with you from beginning to end; capturing all of the details and intimate moments from your wedding and reception, without being intrusive and demanding. And have no fear; I always have back-up equipment, just in case! I will then have your proof slideshow ready for you to view within a couple of weeks after your wedding date. I will also post your pictures on-line for your friends and family to view. Planning your wedding is a lot of work and can quickly become very expensive. Just remember, down the road, years after your wedding, the only thing you will have left are your memories. Your friends and family probably won’t remember your decorations, or what was served for the meal, or even how your invitations looked or the gifts you gave your guests. Will you remember everything about your wedding and even who was there? With a good professional wedding photographer who can capture all of those memories, you will! If you need to cut corners on your wedding budget, make sure it’s not on your photographer. Remember a picture is worth a thousand words! For more information on having Kurt tell your story, call Kurt Nielsen Photography at (419) 885-7153.